Description: This medium-sized black-and-white woodpecker is white below, has a plain white back and black wings with white spotting. The tail is black in the center with white outer tail feathers. The face is white with black stripes, and the bill is black, thick, and nearly as long as the head. Males and females are easily distinguished; the male has a red patch on the back of the head, and the female does not. Voice: The song is a short even-pitched rattle. The call is a strong sharp peek. Downy Woodpeckers are very similar in plumage, but are smaller, and have a proportionately smaller bill (see link below). Their song is a rapid downward whinny of notes, and the call is a soft quick pik. The Hairy and Downy call-notes are distinguishable with practice. Yellow-bellied Sapsuckers have smudgy barring in the white on the back and a white stripe on the side. 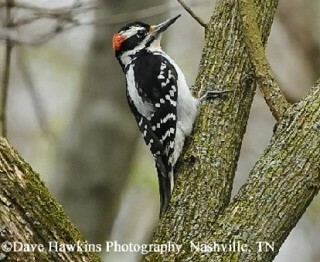 Habitat: Found in most forest types in Tennessee, but tends to occur in larger, more mature woodlands than the smaller and similar appearing Downy Woodpecker. Studies have shown that Hairy Woodpeckers are attracted to forests that have recently burned, probably due to increased food resources in dead and dying trees. They also occur in residential areas with large trees and visit bird feeders, especially suet feeders. Diet: Insects and other arthropods, fruits, and seeds. Males tend to forage higher than females in winter. Nesting and reproduction: Hairy Woodpecker pairs maintain territories throughout the year and may remain mated for several years. Breeding behavior begins in late fall with the male and female drumming in response to one another. Clutch Size: Usually 4 to 5 eggs, with a range of 3 to 6. In Tennessee, egg laying is usually mid- to late April. Incubation: Both parents incubate the eggs for about 11 to 12 days. Fledging: Both parents care for the young, which fledge in 28 to 30 days. They remain dependent on the parents for several more weeks. Nest: The pair usually excavates a new nest annually in the trunk of a dead tree. The nest takes 7 to 24 days to complete. The average nest height in Tennessee is 20 feet above the ground. Status in Tennessee: This woodpecker is an uncommon permanent resident across the state. It is not as numerous, nor as tame, as the Downy Woodpecker. Population appears stable. The Hairy and Downy Woodpeckers occur together throughout most of their ranges. The Downy Woodpecker uses smaller branches, while the Hairy Woodpecker tends to spend more time on the trunk. The Hairy Woodpecker is attracted to foraging Pileated Woodpeckers and will take insects in the deep excavations that the Pileated missed. The oldest recorded Hairy Woodpecker in the wild was 15 years 10 months old. Best places to see in Tennessee: Found in large tracts of forest with large trees across the state. Jackson, J. A., H. R. Ouellet, and B. J. S. Jackson. 2002. Hairy Woodpecker (Picoides villosus). The Birds of North America, No. 702 (A. Poole and F. Gill, eds.). The Birds of North America, Inc., Philadelphia, PA.